A conviction on burglary charges can have severe, lasting ramifications. You’ll pay fines and possibly serve jail time. A house breaking conviction will damage your family, your other relationships, and your ability to secure employment. Seattle burglary attorney Kevin Trombold has more than two decades of experience representing clients who are charged with a variety of crimes including burglaries. In those decades, Mr. Trombold has built a reputation for legal excellence as a top, dedicated defense attorneys in the state. If you face charges for burglary in the Seattle area, call the Law Offices of Kevin Trombold promptly. A burglary crime is not necessarily a robbery – the burglary law makes a distinction. Typically, burglary is defined as breaking into a building or residence with the intention of committing a felony or misdemeanor. The burglary charge is more serious if the building is occupied or if a burglar uses force or weapons. Robbery typically involves a targeted victim and weapons or violence, but a conviction for either robbery or burglary can send a defendant to prison. In any criminal prosecution such as a burglary case, a prosecutor must be able to prove beyond a reasonable doubt that the suspect is guilty. In burglary cases, the prosecution needs to prove that a suspect intended to commit a crime upon entering a building or residence. Experienced Seattle burglary attorney Kevin Trombold knows how to raise doubts in the minds of jurors. If you need high-quality defense representation to fight a burglary, robbery, or shoplifting charge, contact Seattle attorney Kevin Trombold immediately. There are several different types of housebreaking that you could be charged within the state of Washington depending on the specific circumstances of your case. Burglary in the first degree is considered a felony and can be punishable by a $50,000 fine and up to life in prison. Second degree house breaking is defined as entering a building, with the exception of a vehicle or a residence, with the intention to commit a crime against a person or the property. If you are convicted of second degree burglary, you could face up to 10 years in prison, along with having to pay $20,000 in fines. Residential burglary is very similar to second degree burglary, with the exception that it involves entering or unlawfully remaining in a residence. This crime is a felony and is punishable by up to ten years in prison and $20,000 in fines. Although residential house breaking and second degree burglary are similar, residential house breaking is considered the more serious crime of the two. You may also be charged with manufacturing or possessing burglar tools on top of any burglary charges that you may already face. Burglar tools are any tools that could assist you in committing housebreaking, including keys, lock picks, crowbar or other similar items. You can only be charged with this crime if it is inferred that the tools in your possession were carried with the intent to commit a burglary. If you happen to be convicted of this gross misdemeanor, you could face up to one year in jail and face a fine of $5,000. Vehicle prowling is a crime that is closely related to housebreaking, and therefore often grouped together with it. This crime is committed when an individual enters or unlawfully remains in a motor home, motor vehicle or boat with the intention to commit a crime. Basically, it should be thought of as house breaking but not to a residence or building, but rather a vehicle or house boat. Depending on the specifics of the crime, it can be charged as either a felony or misdemeanor. If you followed through with your intent to commit a crime while entering or unlawfully remaining in a residence or other building, then you may face additional charges depending on the crime that you committed. Every charge that you face may add additional time to your sentence. If you or a family member or friend has been charged with any form of house breaking, contact a knowledgeable Seattle burglary attorney promptly. Our team of attorneys will thoroughly review the details of your case to devise a sound defense strategy. Although the strategy that is chosen will heavily depend on the circumstances of your case, there are a few of the most common types of defense strategies. One of the most common is arguing that you didn’t have the intention to commit a crime. Remember, in order to prove burglary, the prosecution needs to prove that you had the intent to commit a crime when you entered the building or residence. If there is no intent, then the crime of house breaking was not committed. Another defense is to argue that you had authorization to enter the property, and therefore did not commit the crime of burglary. Our team of knowledgeable attorneys will also work to disprove any evidence that is presented in the case against you. Witnesses will be aggressively cross-examined to expose any flaws or inconsistencies in their story. Throughout the entire process, our team of experts will always be by your side to explain the legal options available to you. If you have received a charge with house breaking, don’t wait to contact an attorney. A criminal charge can have the potential to ruin your life if you don’t get the right help from a criminal defense attorney. 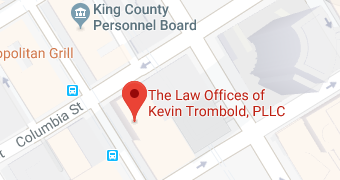 If you are charged with a crime around the Seattle area, call the Law Offices of Kevin Trombold at 206-382-9200 promptly.